Article written by Shannon Kinney, Founder and Client Success Officer of Dream Local Digital. Well-intentioned people will tell you that you are crazy to pursue your dream, and in your low moments — which will come — you may start to believe them. Being a startup founder, or in a leadership position at a startup, requires a thick skin and a high tolerance for change, disruption, and the rollercoaster ride. You have to trust yourself and be true to your vision and mission. Only compromise when it improves what you’re doing. No matter how many times you’ve done this (Dream Local Digital is my seventh startup), you always underestimate how long it will take and how much you will have to sacrifice. You cannot anticipate how much energy, money, time and focus your startup will demand from you, and how it will impact your life in a myriad of ways. And, then, there’s the work in endless supply and the sleep that is not. Passion is what gets you through it, has you jump out of bed in the morning ready to start all over again. I have a print on my wall with one of my favorite quotes: “If everything seems under control, you’re not going fast enough”- Mario Andretti. This couldn’t be more true! Many startup founders forgo a salary for an extended period of time when starting, and self-funding in the beginning is an important way to ensure that you believe strongly in the problem you are solving. 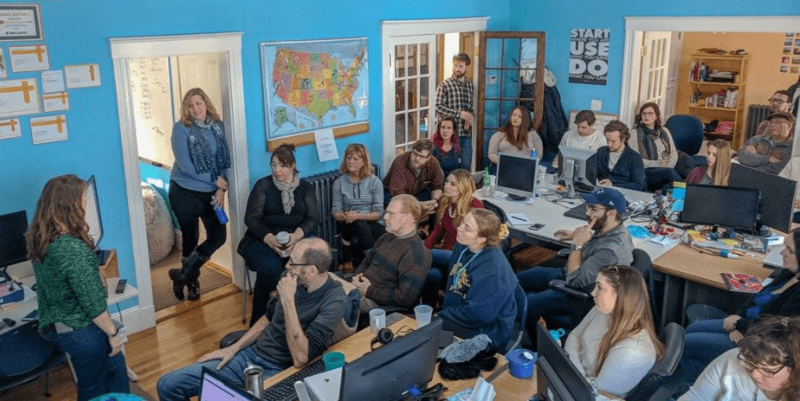 If I could look back to one thing I did right in the building of Dream Local Digital, it was that rather than rushing to create my own pay, I invested in others to lead teams or build aspects of the business. I knew that if I created a role for myself where I was critical to the majority of day-to-day operations we would never scale. Ever. While I was (and still am) good at many of the jobs in the company, you cannot build a scalable business if it relies upon you. This is the key difference between building a job for yourself and a few others and a scalable business. I went without salary for an extended period to invest in future leaders, and over the years there have been times I have given myself significant pay cuts to invest, and it is worth it. Both in your financial investment, and in how you allocate your time and priorities of your work, you need to work on building your business instead of work in the business. Not only will your business grow as a result, but it improves the overall health of your company. 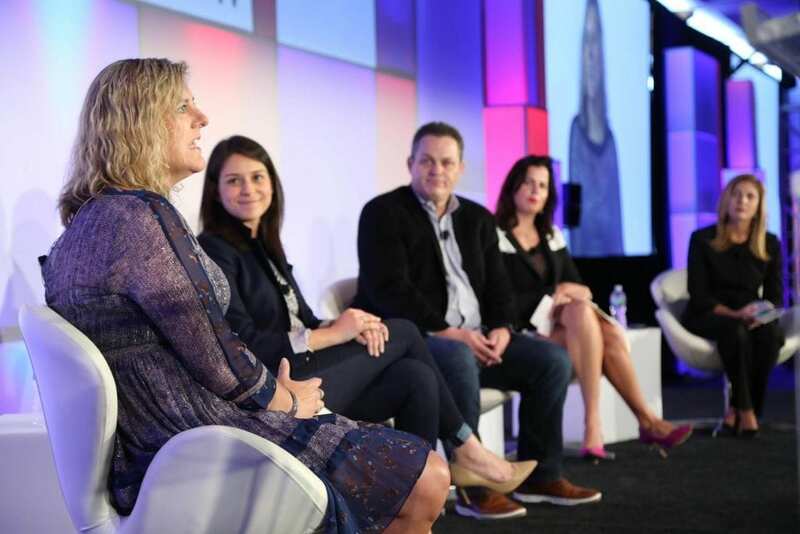 I cannot stress enough how important the development of a strong company culture is. People want to be inspired in their work, they want to feel like they are part of something bigger. This is important especially when you’re leading a startup and you need your team to be as passionate about what you are doing as you are to make it happen. Early on at Dream Local Digital, I realized I needed our culture to create some common bond among people from a wide variety of backgrounds and chose the #HoneyBadger as a symbol (learn more about that here). It permeates our culture in how we talk to each other, in our values, in our daily work. Authenticity is key. 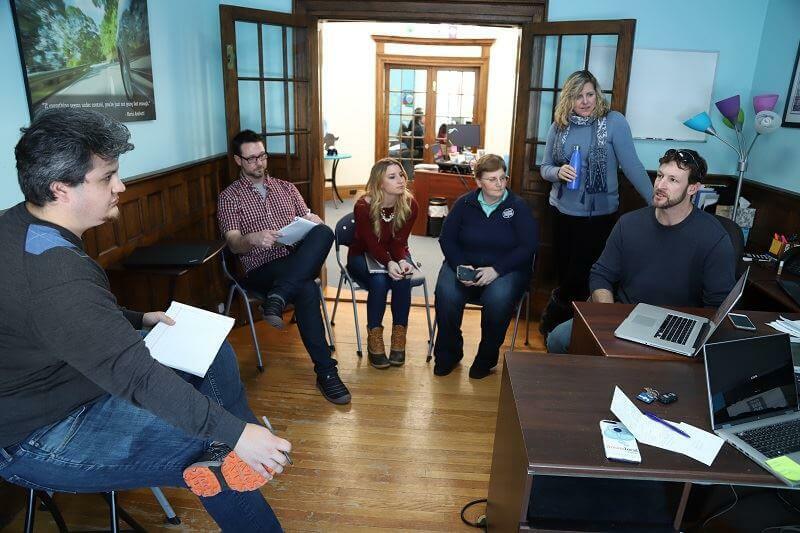 I spend a significant portion of my time focused on culture in a variety of ways, and do all I can to keep my finger on the pulse of what the teams and individuals at Dream Local Digital are doing. As a founder and leader of a company, you are the smiling face of the company whether things are going well or not well. It’s important to set ego aside and recognize that these are cycles and not get too attached when it is too good, or when it is too bad, because what is absolutely true is: it will change. I find it’s important to be conscious of this, and in my company culture, be transparent about that with my team. You need to be responsible and accountable for the success of your business, and take ownership with your team and lead, particularly in challenging times. I also find that when I become concerned about a particular person, team, or part of the business, I need to turn it around and see it as an opportunity to lead. It’s always my job to jump in and help that person, that team find their way to greatness, and do whatever it takes to clear a path for them to get there. I was once asked in an interview how much I thought luck factored into my journey building Dream Local Digital. While I do believe I am a very fortunate person, and the practice of gratitude plays a large role in my life, when it comes to business I believe you build your own luck. What I mean by that is you set yourself up for success by surrounding yourself with people smarter than you, who are strong where you are weak, who will challenge you (and their teammates) to bring their best every day, who get you and your vision, who would do whatever it takes to make it happen. Without thinking about what’s in it for you, you give to your network, your friends, your potential customers, your team. And, it comes back. I’ve been immensely fortunate that this comes naturally to me, and now have people that have been on my team and/or been in my life for years. We have had customers for years, and we have partners that I have known and served through multiple startups. One of the quickest ways to kill a startup or a team within a company is to try to control every aspect of the business. You won’t attract, nurture or develop top talent if you don’t let them shine without micromanaging them. People won’t always do it your way, and they may not do it as well from time to time. But often, they will do it better. You need to foster creativity of thinking, problem-solving, an environment of idea exchange – and you cannot do any of that by trying to make everyone follow your one way of doing things. You’ll also burn out if you try to do everything yourself. And that is not inspiring for your team or healthy for your business. Finally, when it comes to taking care of your customers, you need your team to feel like they can make a call based on your values to quickly resolve issues or surprise and delight your customers. Empowerment is the only way to achieve that. It is easy to become too close to what you do and lose sight of the customer who uses your product or service, even when you don’t mean to. You and your team can think about constraints you face internally in your operations, or you may be thinking about what’s easiest to do to serve your customer. However, especially in today’s very public marketplace where a bad review can go viral and cripple you, it’s critical for a startup to not fall into that trap. It’s also important when marketing and promoting your business to be able to appeal to potential customers. You need to understand what motivates your customers to buy from you, articulate clearly and in the language of your customer what problems you solve for them, and then do it. One of the key decisions I made early on, that became a core value of the company, is retention over revenue. Meaning, while I love revenue (and I do), I don’t want us to sell solutions that won’t work as well for the client. We recommend what our experience shows us will drive results for that customer. As a result, we have grown more slowly than other peers, but we have the highest retention rates in the industry. Especially in the early days of a startup when money is tight, it’s easy to think failure is a terrible thing. We’ve made mistakes here that have cost me personally tens of thousands of dollars multiple times. Here’s what I know. While the sting of losing money is there, it doesn’t last NEARLY as long as the lessons from a mistake. Every mistake should be set up as a learning experience, and shared with your team. Don’t hide, don’t practice shame. When you don’t know the answer or a mistake is made, take it as a gift to learn. Same is true with feedback both positive and negative. It is a gift and opportunity to learn and up your game. Our core #HoneyBadger trait is that we will do whatever it takes to get the job done for our partners and customers. As a founder, you need a deep commitment and unwavering persistence in the face of the many obstacles you will face. People who don’t get what you’re doing, skeptical investors, potential employees that may perceive working for you as too risky, friends and family who think you are crazy, banks who tell you you are unbankable, bumps in the road in the development of your product or service, moments where you wonder how you will make payroll, your body when it tells you that you need to sleep more and work less. And you will likely face these obstacles for a very long time. Persistence has to authentically be ingrained deep into your own psyche, and in my case, into the psyche of my team and our overall culture. To achieve growth and scale, you need to constantly be pushing harder, moving faster, innovating more. There isn’t a slow period. If there is, you’re likely burning money or time or both. Persistence is the one key ingredient to help you power through all of that as a leader, and as a team. While all of the lessons have been critical over the decade building Dream Local Digital, and the other companies I helped shape, there is nothing more important than the power of persistence. While circumstances, market conditions, bank account balances, customer needs and employee relationships will continue to test your resolve, you need to be steadfast in your willingness to jump out of bed and get right back at it the next day. Do whatever it takes to continue to strengthen, rejuvenate, and reinforce that trait within yourself. When you find your resolve faltering or your drive slipping, you need to take action to correct it. Persistence is what will give you the power to win. It has been an amazing journey building Dream Local Digital, and I look forward to the next 10 years and lessons they will bring. What are your biggest areas of growth in the coming year? Which of these resonate most with you? Shannon Kinney is the Founder & Client Success Officer, AKA “#HeadHoneyBadger” of Dream Local Digital. She is a seasoned startup Founder and Executive with over 25 years of experience. She is considered a thought leader in the online space, and is a highly sought after keynote speaker, advisor and consultant. With deep experience in sales, marketing, online product development and leadership, this is her third nationally-scaled digital marketing solution company. She founded Dream Local Digital in 2009 “to bring the power of online marketing to small and medium sized businesses”, and also to master the craft of how to make SMBs successful on social media. She has a wide and highly engaged network of leaders in media, technology, and startups worldwide, and has developed Dream Local Digital to be a widely recognized brand as best of breed in social media fulfillment.